Sporting Dogs, epitomized by the Labrador Retriever, can make some of the best family pets! Sporting Dogs are friendly and loyal dogs. They are also quite lively and full of spirit. They need a lot of exercise and will excel in field activities. The Sporting Dog is often referred to as a gun dog or a bird dog. They were developed as superior hunting dogs and to work closely with the hunter as well as other dogs in the field. Bred to bond closely with man as well as other dogs, many of the Sporting dogs make exceptional pets. The Labrador Retriever is the quintesencial family pet. Like it, many of the Sporting Dog breeds are gentle and affectionate with children. Most will get along well with other pets, though there are a few that can't be trusted around small animals. An energetic companion, they love playing with their family outdoors. Dog Breed Information: Sporting Dogs are Gun dogs with strong water and nature instincts and they excel in field activities. The popular Pointer, Spaniel, Retriever and Setter gamedogs are just some of the results of dedicated hunting dog training, backed with years of breeding. 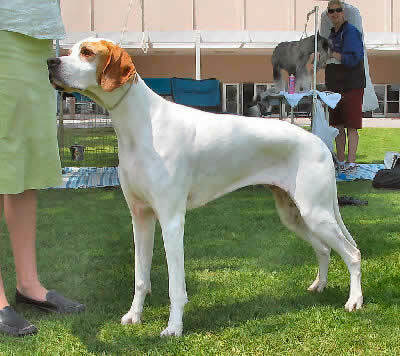 Other hunting dogs are the Hound dog breeds, but the Sporting dog breeds differ from them because they hunt by scent carried in the air, while the hounds are ground scenters. Today's Sporting dogs have remarkable instincts and are excellent for hunting in both water and on land. Each type of these hunting dogs was developed with a unique set of skills. The Pointer spots its quarry, and then as its name implies, this gun dog stands rigidly pointing towards it. The Setter was also trained to point, but also to crouch in front of its quarry while the hunter captured the prey. The Retriever has the job of finding the killed game and returning it to the hunter. And the Spaniels, both the Water Spaniel and the Land Spaniel, are favored as bird dogs that flush birds out of cover and into flight. Dog Care Tips: Bred to bond closely with man as well as other dogs, many of the Sporting dogs make exceptional pets. These friendly loyal dogs are a favorite family pet. They are gentle and affectionate with children. Lively and very energetic, they need a lot of exercise. They love playing with their family outdoors and will excel in field activities. Most will get along well with other pets, but there are a few that can't be trusted around small pets. If you are interested in getting a Sporting dog, it is a good idea to learn as much as you can about breed type. Know the traits and behaviors your dog may demonstrate so you can provide the proper care, housing, and exercise for your pet. All companion dogs, no matter what their makeup, will benefit from good socialization and training.